Elegant, traditional design details and distinctive finishing touches present a sense of uncommon luxury in the Weymouth collection. Distinctive accents include porcelain inlays that feature Euro-influenced decorative script and signature styling elements. Features a clean single hole installation. The Mateo Single Lever Bar Faucet has a streamlined silhouette that coordinates with any bar or prep sink, with a spout that swivels 360 for added flexibility. This faucet is made with top-quality components in order to ensure superior performance and durability. A QuickDock mounting assembly eliminates the need to secure the faucet underneath the sink, making top mount installation exceptionally easy. Moen's quality products are designed especially for commercial applications. Moen Commercial faucets offer many convenient features including wrist-blade handles; metering faucets, grid strainers, and pressure balancing tub/shower valves. Moen Commercial faucets feature washerless or ceramic disc cartridges. It's the only replacement part a Moen faucet should ever need. The Pot Filler is the ultimate epicurean luxury sure to inspire the master chef in you. Classically styled, the Pot Filler swings out over your stove to easily reach all burners. The Pot Filler cannot be defined or appreciated by function alone. Sleek, clean design enhance the contemporary gourmet kitchen. 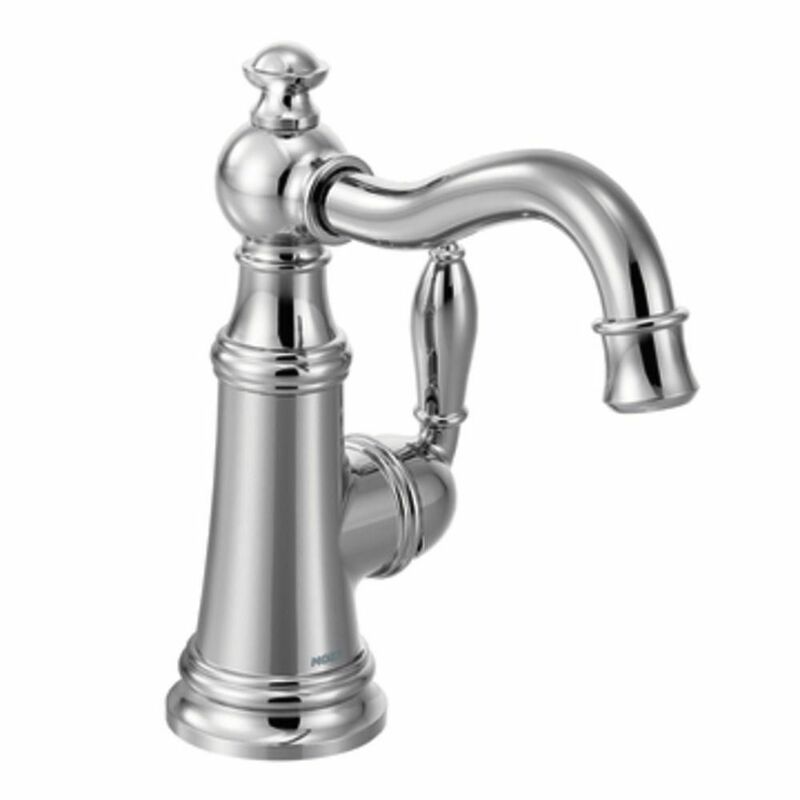 Weymouth Chrome One-Handle High Arc Bar Faucet Elegant, traditional design details and distinctive finishing touches present a sense of uncommon luxury in the Weymouth collection. Distinctive accents include porcelain inlays that feature Euro-influenced decorative script and signature styling elements. Features a clean single hole installation.